The dog on the left was found in Dalton, Georgia on December 25, 2016, listed with Helping Lost Pets on December 26, 2016. 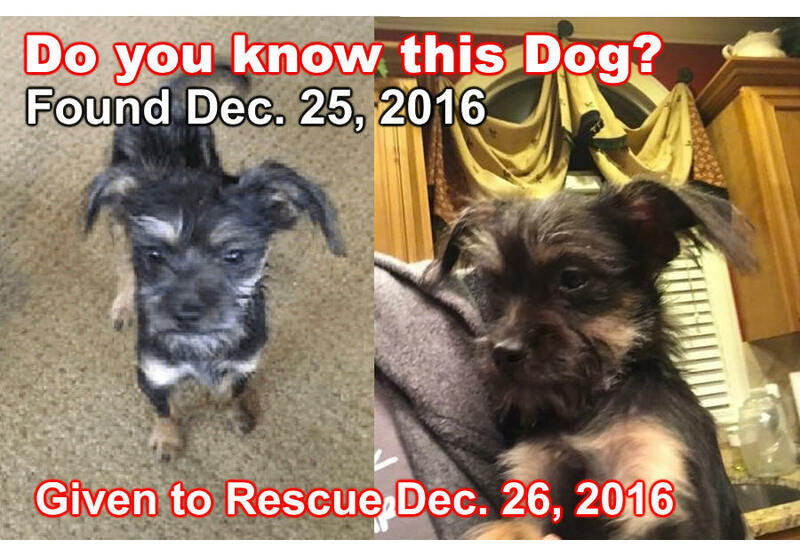 Given to an out of state rescue on December 26, 2016. The dog on the right was put up for adoption by the rescue on December 27, 2016. One of our goals is to work with the animal control facilities and shelters to untangle the mess that is currently the lost pet recovery system in our nation. The main function of tax-payer funded animal control is to hold lost pets until owners reclaim them, thereby protecting the public from traffic accidents, dog bites, scratches, etc. caused by loose pets. Our organizations advise people that have found a dog to contact their official local stray holding facility (whether it be the shelter, a vet clinic or kennel, the town office or police department). Some stray-holding facilities will allow the finder to “foster” the dog until an owner is found; but many want the dog brought to their facility. And that is okay, as long as they are doing everything possible to proactively reunite the dog with their family. Unfortunately, there are still stray holding facilities that do not proactively search for an owner and the dog may be at risk of being put down at the end of the stray hold period. In these municipalities it is common for a Good Samaritan (the person who has found a loose dog) to want to ensure the best possible outcome for the dog. The higher the “kill rate” of a shelter, the less likely it is that the dog will be taken there. Instead of taking the dog to the correct animal control facility for the location, the Good Samaritan may surrender the dog to a rescue. We understand this and appreciate the Good Samaritan’s compassion for the dog. Unfortunately, many of these dogs are never reunited with their owners, and instead are rehomed to new adopters who may not realize that they have adopted someone else’s dog. Rescues have the responsibility to make sure that the dogs they are rehoming are truly homeless. If they aren’t, they are simply selling someone else’s property, a criminal offense in all fifty states. We have compiled this checklist to help rescues find the owner of a missing dog. This does not exempt the rescue from liability if an owner comes forward after the dog is rehomed. Civil cases brought forth by an owner against ar rescue or a new adopter are being won in court. Scan the dog for a microchip several times with different scanners using Best Microchip Scanning Procedures. If a microchip is found but appears to be a “dead end” fill out a form for our free service by clicking here. This can be used even if the microchip is unregistered. The owners of many dogs with unregistered microchips have been found through this service. Fill out a found dog report with Helping Lost Pets with several clear photos of the dog from different angles. Keep the listing up to date. Print out the free flyers provided by Helping Lost Pets and distribute them door to door in the area where the dog was found. File a found dog report with the correct stray holding facility for where the dog was found, as well as those in surrounding communities and counties. It is not uncommon for a dog to travel a long distance when they are lost or to be taken to a neighboring county shelter by a Good Samaritan. File a found dog report with all police departments, sheriff’s offices, town and county offices and other local authorities in the immediate area and neighboring communities. This is often the first place that owners will contact. Contact all local vet clinics, pet boarding facilities, groomers and pet supply stores to ask if they have had any reports of lost dogs. Supply them with a found dog flyer to post. Scour the lost dog listings in the area including Craigslist, Nextdoor, Everyblock or other neighborhood sites, Facebook groups, local newspapers and radio stations and all lost and found pet internet sites including of course, Helping Lost Pets – the nation’s largest database for lost and found pets. Consider that the dog could have been lost a long time and do not let appearance factors like weight, overgrown toenails, matted coat, etc. deter your search for an owner. Also consider that the last person who had the dog may not be the rightful owner. You owe it to the dog to find the rightful owner and find out the truth. Consider that the owner may not speak English or may not have a cell phone or the internet. Do not assume that because no one has responded to your social media posts, that the dog has been abandoned. Many people are not on social media or do not have access to the internet. Expand your search for an owner to include other languages. Use more traditional methods of getting the word out, such as door to door flyering and signs. These steps will ensure you have done your due diligence to find the legal owner of the pet and would minimize any possible future legal action if an owner comes forward later. However, the only way you can truly indemnify yourself as a rescue, is to only pull dogs from shelters after they have completed their legal stray hold time. We understand that this places an additional burden on rescues but the positive implications are huge. Rescues who reunite a dog with their rightful owners free up an adoptive home for a dog who truly needs it. Valuable money and resources can be saved to help truly homeless dogs. Happy reunion stories are widely shared and can elevate the rescue’s reputation in the community. This increased goodwill (and potential donations) enables the rescue to save more lives. Let’s all work together to help more lost dogs get home! Microchips, Shelters and Rescues, Useful Tools found dogs, Helping Lost Pets, Microchips, rescues. permalink.